On Saturday, the World’s Smallest Woman arrived for her annual run in Coney Island prior to playing the September 13-23rd Feast of San Gennaro in Little Italy. The single-O attraction is set up in Cha Cha’s Steeplechase Park near the West 12th Street entrance. 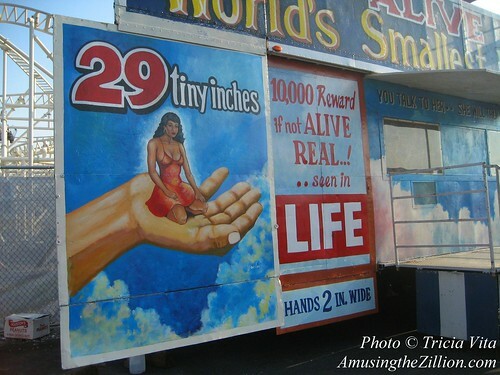 ATZ learned that this particular “World’s Smallest Woman” is named Elizabeth and hails from Haiti. 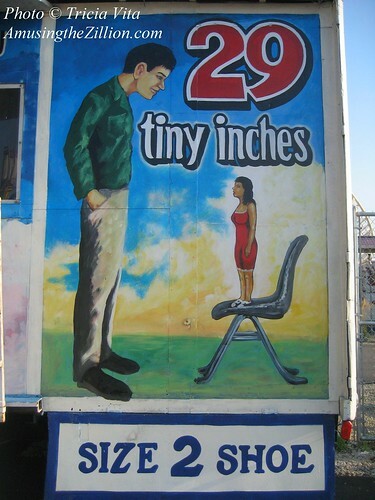 She is one of sideshow impresario Jack Constantine’s five “World’s Smallest Women” who travel the U.S. carnival and fair circuit. We’ve seen this ever-popular attraction at the New York State Fair, Florida State Fair and State Fair Meadowlands, among others. Four of the ladies are Haitian and one is Jamaican.